Missoula Maverick Riley King bats during the top of the third inning April 22, 2012, during a game against the Helena Senators at Lindborg-Cregg Field in Missoula. The Mavs swept the Senators, 14-4 and 12-3. 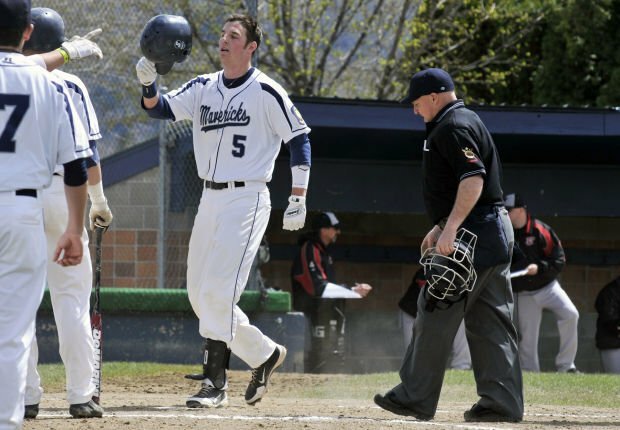 Riley King steps on home plate after his three-run homer in a recent game against Bozeman at Lindborg-Cregg field. King signed a contract with the Kansas City Royals on Sunday night. Missoula Mavericks’ Riley King was all smiles after it was announced between games Saturday that he had been drafted by the Kansas City Royals. He was disappointed in the way any baseball player tends to be multiple times each game on average. In his last at-bat against the Helena Senators on Saturday during the Missoula Mavericks’ first of a doubleheader between the squads, he’d just recorded an out. Luckily, King was about to get a serious pick-me-up. As he exited the home dugout and trotted out to center field alongside left fielder Tanner Rheinschmidt, his teammate relayed some second-hand news. The 19-year-old, right-handed swinging King had been picked by the Kansas City Royals in the 24th round of Major League Baseball’s first-year player draft just moments earlier. What Rheinschmidt had overheard, the public address announcer would relay to those in attendance at Lindborg-Cregg Field in between games Saturday. The Royals made King the 714th pick of the draft. Following the games, the 6-foot-4, 210-pound King said he had an inkling that Saturday could be the day he’d hear from MLB types. Both the Royals and San Diego Padres had contacted him over the previous months. They’d hinted that if either franchise were to pluck him from the American Legion baseball ranks in Montana, he’d be a late-round selection on the draft’s final day. “It’s such an unpredictable thing,” King said of the 40-round, 1,216-player draft. “Obviously there were a lot of nerves going into it. Entering Saturday’s games, King was hitting .422 for the Class AA Mavs with four home runs, four triples and six doubles while knocking in 25 runs. The big center fielder has also showed some speed on the base paths with 24 steals in 26 attempts in 34 games this season. King’s present – marked with colorful jubilation – will soon be followed by a future filled with decisions to make. 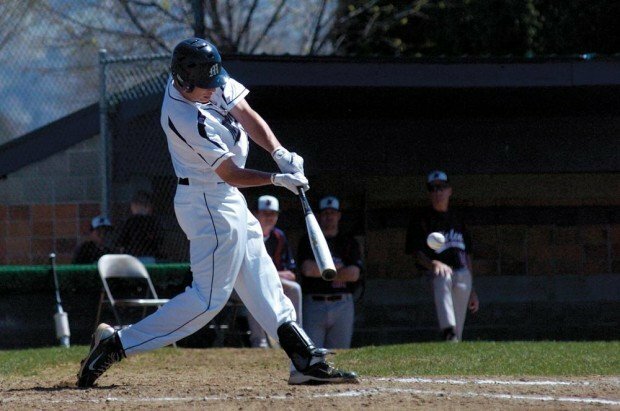 A multi-sport athlete during his time at Missoula Sentinel High School – from which he graduated in 2012 – King attended Carroll College last year to play basketball for the Fighting Saints. Now comes the choice of which sport’s path to follow. “I’ve got to talk to them (the Royals) tonight, and obviously my family and figure out what’s the best opportunity for me and what I want to do,” King said. Missoula Mavs manager Brent Hathaway seemed to have an idea which direction his star center fielder would lean. King averaged 6.7 points per game as a true freshman last basketball season at Carroll, adding 2.9 rebounds, 2.4 assists and 1.1 steals per game on his way to earning the Frontier Conference Freshman of the Year award. The only Montana player drafted in 2013, King is the third Maverick in three years to get the call on draft day. Pitcher Andrew Sopko, a Loyola Sacred Heart grad, was picked by the Padres last season in the 14th round. The year before, another Sentinel center fielder, Ben Roberts, was chosen by the Arizona Diamondbacks in the seventh round. Both players turned down professional contracts to honor commitments at the collegiate level – Roberts at Washington State and Sopko at Gonzaga. Roberts might have had a chance to play for the hometown Missoula Osprey, an advanced rookie league affiliate of the Diamondbacks, had he signed. The recent three makes as many as eight players chosen overall in Hathaway’s 23 years with the Mavs, he said. It’s a dream that King said he’s had for much of his life. Though he grew up a New York Yankees fan, he loved the game enough to watch almost any team. He was never much of a one-team follower. King may have finally found a favorite now, though. “Definitely now, the Royals are up there,” he said with a chuckle. Reporter AJ Mazzolini can be reached at (406) 523-5298, at anthony.mazzolini@missoulian.com, @AJMazzolini or missoulapreps.com. Former Mav Riley King to play in N.C.
Former Missoula Maverick Riley King will start his 2014 minor league baseball season in Burlington, North Carolina. Riley King signed on the dotted line Sunday evening.